At times,even the greatest people face toughest situations. When the devotees of Baba are caught in between situations like 'the devil and the deep sea,' they would not hasten to overcome them. They pray to Baba to help them in crossing it. They would wait with patience till help reaches them. They know that Baba's help would come to them at the right time. 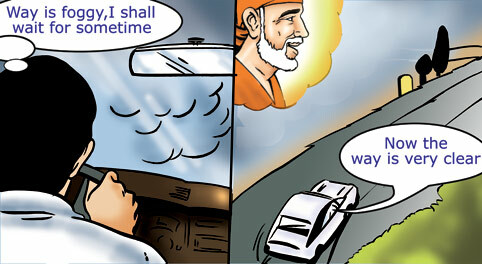 But, whether one should wait minutes, hours or days will be decided by Baba. Sometimes the nature of ego "myself" will provoke a man to feel impatient. So, we should not hasten to conclude that help is not forthcoming. We should sincerely wait with patience and tolerance till the situation improves. Baba is the Omniscient and is present everywhere. It is He, who decides what work to be done and at what time. Do we continue the car journey when a thick blanket of fog envelops the path? If a valley is noticed on the side and thick fog in front, people with presence of mind and endurance would stop the car and wait till the fog melts away. Likewise, if we patiently wait for Baba's help in times of trouble, the problems would melt like snow. Our path of life becomes trouble-free. Baba used to ask the devotees to offer two coins, viz, faith and patience. Having faith in Baba, if we wait patiently, He will guide us safely and successfully to reach our destination.